Cost to attend is $100 per junior high student. Payment via credit card available below. You may also select "pay at event" and bring cash or a check made out to Solomon Episcopal Conference Center (SECC). Scholarships available by contacting Mother Jane-Allison Wiggin-Nettles at jwigginnettles@edola.org or by calling or texting 504-295-1375. Cost for staff to attend is $150 per person, which includes the additional dinner and lodging Friday night. (Only staff arrive and stay Friday night.) Scholarships are available for staff members. What to bring: Your creativity, willingness to stretch, paint, and create, and clothes that can get messy. Leave cell phones and smart watches at home or turn in during registration to enjoy the retreat unplugged. Bring personal toiletries and an instrument if you play. Bedding and towels provided. “Rally” is a time for youth to relax, retreat, fellowship, and grow in their faith. Rally is planned by the Diocesan Youth Leadership Committee, a group of youth and adults from around the Episcopal Diocese of Louisiana. 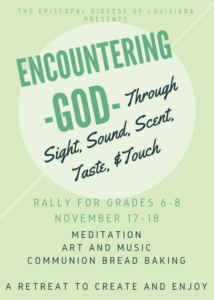 Junior High Rally is open to all youth in 6th, 7th, or 8th grade in the Episcopal Diocese of Louisiana and friends from any religious backgrounds. This is a Christian retreat that is open and welcoming to all. For any registration questions not related to scholarships, please contact Holly Shaw at holly@seccla.org or at 985-748-6634.